Here he is our first Black and White Boy! 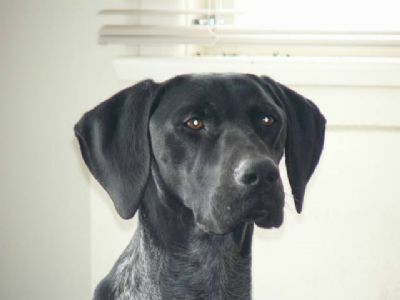 He has very strong personality and absolutely loves the show ring! His first outings under gundog and gsp specialists has proved fab! Sure there is plenty more of wins to come from this young fella. He is doing a short stint in the North Island before heading back down to the South Island. 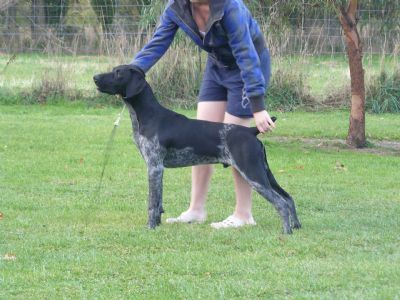 His first shows in the North sees him taking BABY PUPPY IN SHOW at the Auckland & Regions GSP Specialty! 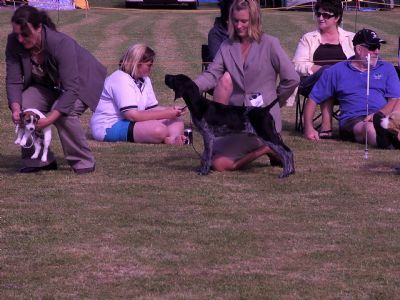 Ash is now back in the south island and his first weekend of shows sees him take another Baby Puppy of Group (Allbreeds) and 1st place in the Allbreeds Puppy Sweepstakes. Ash wins the Plate Section in the South Island Puppy Supreme Competition first GSP to do so!! !